As embarrassing as this is to admit, I have been reading manga for a very long time. I started reading manga as a freshman in high school in 1998, back when Japanese comics were published in America as forty-page, A5-sized, left-to-right-reading comic books. A lot of things have changed in both American manga publishing and in my own personal tastes in manga since then, but two things have stayed the same. The works of CLAMP have always been popular, and I have always loved them. CLAMP is a creative team made up of four women: Ōkawa Nanase, Igarashi Satsuki, Nekoi Tsubaki, and Mokona. They have published popular shōjo stories (meant for girls) like Magic Knight Rayearth and popular shōnen stories (meant for boys) like Chobits, but they have always managed to effectively erase the line dividing the two different demographics. A good example of this might be their popular manga Angelic Layer, which was serialized in the manga magazine Weekely Shōnen Jump (home of such boys’ fare as Dragon Ball, Naruto, One Piece, and Bleach) but which features a young female protagonist who trains and fights her battles with small dolls dressed in ornate and fantastic costumes. CLAMP therefore has a huge fan base spanning both genders, and what’s not to love about them? They have written stories falling into every conceivable genre, from fantasy to romance to science fiction to mystery to historical fiction to reworkings of classical mythology. Their artwork is not only beautiful and varied but also constantly evolving. They are masters of the art of storytelling, always paying careful attention to plot and pacing and always managing to keep their stories moving forward and full of fresh twists and surprises. They care about their characters and rarely write good guys who are entirely good or bad guys who are entirely bad. Their manga almost never end in simple, easy ways. I admit that I have met more than a few people who do not care for CLAMP and their particular flavor of manga. I adore the group, however, and their popularity has grown to such an extent that a beautifully illustrated retrospective of their work, All About CLAMP, was published late last year in Japan. A similar book, CLAMP in America (authored by the perennially awesome Shaenon Garitty), is scheduled to be published stateside in May of this year. CLAMP currently has several ongoing manga series, and several of their manga series have recently been adapted into anime. I feel like right now is a good time to be a CLAMP fan, so I would like to introduce my favorite manga written by these supremely talented ladies. xxxHOLiC (pronounced “holic”) is a story about an irritable yet essentially kind-hearted high school student, Watanuki, whose eyes have the unusual condition of being able to see ghosts. These ghosts cause all manner of trouble for Watanuki, who just wants to live a normal life. When he accidentally stumbles into a magical store run by a wish-granting witch named Yūko, he asks her to cure him. She tells him that she will, eventually, but he first must pay a price equivalent in value to the granting of his wish – he must work part-time in her store every day after school. While doing various odd jobs for Yūko, Watanuki meets all sorts of strange people who want their wishes to be granted, as well as all manner of strange creatures that seem to be friends with Yūko. At school, Watanuki is enthralled by the lovely Himawari-chan and engages in a one-sided rivalry with a boy named Dōmeki, who has the magical power to drive away the ghosts that cause so much trouble for Watanuki (which annoys Watanuki to no end). This description of the manga sounds like a chiché-filled cross between between the “wish granting with a cost” sub-genre of horror (exemplified by works like the Pet Shop of Horrors manga and the Hell Girl anime) and the “I see dead people” sub-genre of almost everything (ranging from YuYu Hakusho to Ghost Hunt) – but it’s not. I promise. Since the plot of xxxHOLiC is tied to that of its über-popular shōnen sister manga, Tsubasa: Reservoir Chronicles, it might also be dismissed as a cheap marketing gimmick – but it’s not. I promise. The series starts off slowly, drawing the reader into its mysterious world and establishing the personalities of its quirky cast of characters. As the story progresses, however, the reader is led to question certain things that have been taken for granted. In the end, nothing is as it seems. 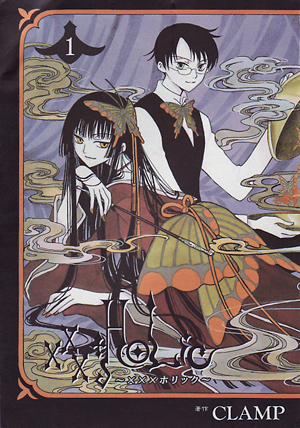 In terms of its narrative structure, xxxHOLiC vaguely resembles something like The X-Files. There are “monster of the week” episodes, but the series as a whole is tied together both by a larger story arc and by a unity of theme running through each individual episode. Unlike The X-Files, however, the shorter story arcs of xxxHOLiC are not easily resolved and are interwoven with each other and the larger story arc, which progress slowly at its own pace. The overall tone of the manga is that of horror and mystery, but there is quite a bit of humor, romance, friendship, and playfulness thrown in as well. I imagine that I could keep praising the various aspects of this manga (such as the brilliantly rendered character of the witch Yūko, the gradual and multi-layered world building, and the gorgeous artwork, which resembles inter-war era lithographs and goes a long way towards establishing the eerie, dream-like atmosphere of the work) for many more paragraphs. 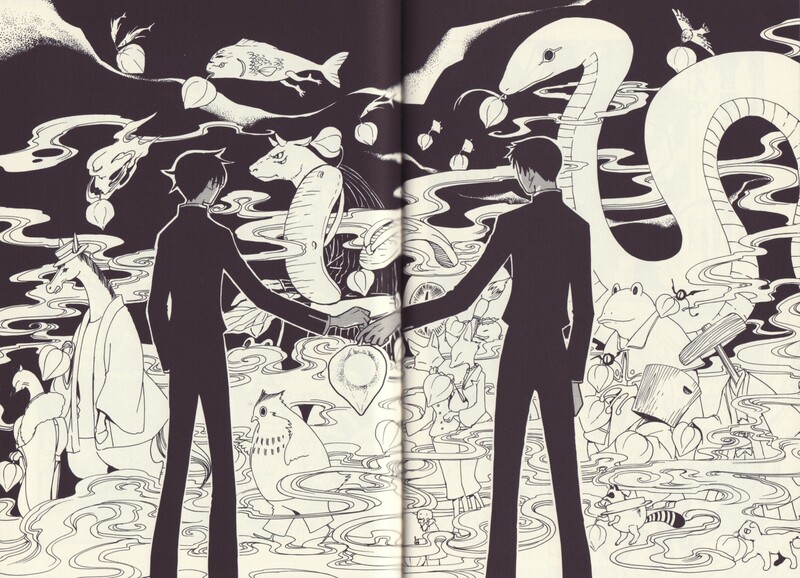 Let it suffice to say, though, that xxxHOLiC is an amazing manga series. I think it is capable of standing its ground against any film or novel. To any manga fan who has been hesitant to read this series because it seems so gimmicky and stereotypical, I encourage you to give it a chance. To any fan of horror, mystery, fantasy, or the gothic who is hesitant to read a manga, I encourage you to give it a chance. In my opinion, xxxHOLiC is one of the most interesting works being published right now in any medium. I have been reading this manga in Japanese in the beautiful volumes published by Kōdansha. An English translation of the series (which I haven’t read yet, unfortunately) is currently being published in America by Del Rey. I would like to close with a two-page spread depicting the hyakki yagyō (“night parade of one hundred demons”) that will hopefully illustrate the distinctive art style that CLAMP has created for this manga. Garitty’s review series is awfully cool, isn’t it? I was glad to see some of my favorite titles-that-no-one-else-has-read on there. Thanks for this lovely review. You’ve hit all the high points of the series, at least as I saw them. One thing, though – Del Rey has the American licence for the manga, not Tokyopop. I’ve been reading their version, and it seems alright. Del Rey used to advertise better translations, but early on they made a big misstep in one of their manga that has led me to heavily doubt that claim. It wouldn’t bug me so much, but they used that as their reason for why their manga cost more than Tokyopop’s/Viz’s. Cool. Thanks for catching that. I owe you one!